Click Here to Register for Online EQUATIONS and begin playing today. This page will remain open, so that you can continue to Step 2. 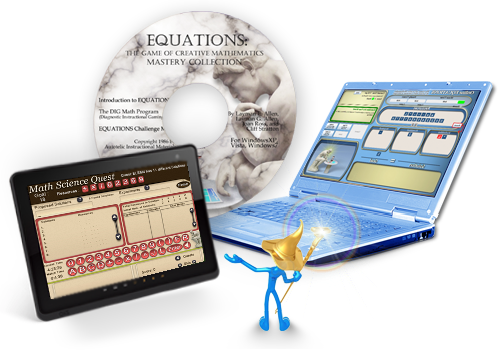 This Bundle includes: Online EQUATIONS, EQUATIONS Mastery Collection Software and Math/Science Quest Download. Retail value: $69, Special Discount Offer: $49 The very latest and best collection of computer programs for learning math from Games for Thinkers. 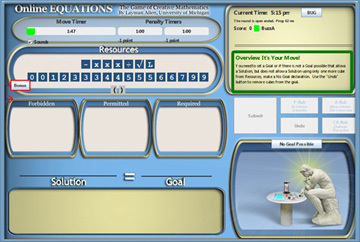 Includes an unlimited annual subscription to play Online EQUATIONS along with the extensive tutoring software in the EQUATIONS Mastery Collection. Also includes the free Math/Science Quest download for computers or tablets. Please note that this version was created for and tested on Android Tablet Ice-cream Sandwich and JellyBean. It should work on other versions as well. This version has also been tested and played on phones, but we will be creating a version specifically for phones to make the gameboard easier to view and use. After downloading the .apk file, run it and follow the installation direction as with all android applications. MSQ will appear in your apps. 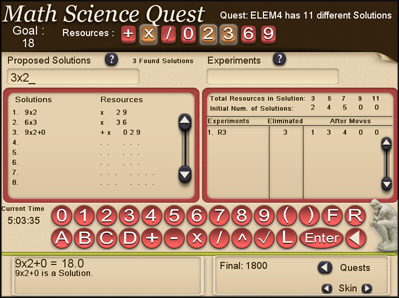 This version of Math Science Quest is still in development, so please email us if you find any bugs. Please note that this version was tested on Windows Vista, and Seven, but should be fine with Windows8 and XP. Remember during the installation process to choose, “Create Desktop Icon” to have a shortcut placed on your desktop. This is not a Windows8 app. The Windows8 app version is coming within a month. Please note that this version was tested on an Ipad2. We will be testing on an Iphone soon using this version which should work for Iphones, but gameplay may be small until an Iphone specific version is released. Because this version is still in development, it is not yet available on the Apple App Store. You will need to connect your device to a Mac running Itunes, select your device, and drag the downloaded file to your device’s desktop in Itunes.